A Tweet last evening guided me to an important story – here it is. Some of you are quite familiar with Professor Charmley, as I am, I consider him a close friend, but in any case, he is exactly correct. This is required reading for any of us who wonders what in the world the Catholic Church is thinking these days. Here is the link again, and here is a snippet. [I]n the latest round of debate over Amoris Laetitia, Pope Francis’s apostolic exhortation on marriage and the family, a fervent defender of the document sniffed at some of its critics that “the Magisterium doesn’t bow to middle-class lobbies” and cited Humanae Vitae as an example of papal tough-mindedness in the face of bourgeois cultural pressures. It was a clever move, rhetorically, and we may hope that it’s right about the magisterial kowtow. But I fear it also misses the point—or, better, several points. At the Synods of 2014 and 2015, to which Amoris Laetitia is a response, the most intense lobbying for a change in the Church’s traditional practice in the matter of holy communion for the divorced and civilly remarried—a proposal the great majority of Synod fathers thought an unwarranted break with truths taught by divine revelation—came from the German-speaking bishops: prelates who represent perhaps the most thoroughly bourgeois countries on the planet. Thus, one does not strain against veracity or charity by describing the German-speaking bishops as something of a lobby for middle-class preoccupations. Passionate defenders of Amoris Laetitia might thus be a bit more careful when dismissing as a middle-class lobby those who raise legitimate concerns about the ambiguities in the document; what goes around, comes around. There was, of course, far more going on in the 2014-2015 German campaign to permit holy communion for the divorced and civilly remarried than lobbying on behalf of the bourgeois morality of secular, middle-class societies. There was, for example, the ongoing, two-front German war against Humanae Vitae (Blessed Paul VI’s 1968 encyclical on the morally appropriate means of family planning) and Veritatis Splendor (St. John Paul II’s 1993 encyclical on the reform of Catholic moral theology). We are told, now, that a commission is examining the full range of documentation involved in the preparation of Humanae Vitae. One hopes that that study will bring to the fore what Paul VI realized when he rejected the counsel of many and reaffirmed the Church’s commitment to natural family planning as the humanly and morally appropriate means of regulating fertility. Do read it all, and think about the implications. I’m no Catholic as you all know, but Rome has provided the best leadership on this since the Second World War, and we will all lose if they lose their voice, and even more, will the children who will never be born lose much more than their voice. Phillip mentioned yesterday that Lutherans have a very clear doctrine of the Eucharist, which is certainly true, and that the controversy between Luther and Zwingli highlighted the differences. That too is true. I didn’t want to go into it on his post, it is a bit far off topic. It is interesting, though, and last night I found a concise summary of the differences by Trevin Wax. It also highlights how it differed from Luther’s contemporary Catholic experience. In the medieval period before the Reformation, the mass formed the centerpiece of Christian worship and devotion. Three centuries before Luther began teaching in Wittenberg, the fourth Lateran council of 1215 established the doctrine of transubstantiation, which holds that upon the priest’s consecration of the bread and wine, the accidents (according to the senses) remain the same, but the substance (the internal “essence”) is miraculously transformed into the physical body and blood of Christ. The implications of this doctrine were widespread. Laypeople began to adore the bread and wine from afar or superstitiously carry pieces of bread back home to plant in the garden for good crops or to give to an ailing animal for good health. To avoid an accidental spilling of the wine, the priests began giving only the bread to parishioners, keeping the cup for themselves. By the 1500’s, even the bread was withheld in most churches. The mass had turned into a show instead of a sacrament. Some parishioners feverishly hurried from church to church to obtain the blessing of seeing more than one host in a given day. Another area in which Luther remained close to Roman doctrine is in the doctrine of the “real presence.” Up until 1519, it appears Luther agreed with the official doctrine of transubstantiation. In 1520, he criticized the idea quite forcefully, painting it as needless speculation based on Aristotelian thought. 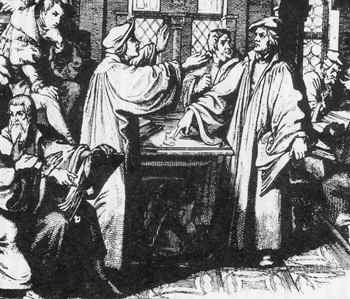 A popular misconception among Reformation students is that Luther affirmed and promoted “consubstantiation,” but neither Luther nor the Lutheran church ever accepted that term. Luther simply refused to speculate on how Christ is present and instead settled for affirming that he is there. The presence of Christ in the Supper is miraculous and thus defies explanation. Roman Catholic theologians strongly emphasized the moment of consecration, when the priest would lift the bread and say “Hoc est corpus meum.” At that moment, bells would be rung and all eyes would be on the elevated host, which had magically been transformed into Christ’s body. Luther similarly emphasized the words of institution, but only because Christ’s command leads to the change, not because the priest has made a special utterance. In this and other practices, Luther was content to alter the understanding behind Roman Catholic practice without feeling the need to actually change the tradition itself. Luther believed that the fruit of the Lord’s Supper is the forgiveness of sins. Roman doctrine held that Communion was for the righteous, those who have confessed their sins to the priest. Luther believed Communion was for sinners, those who needed Christ’s incarnation the most. Zwingli did not see the need for a “sacramental union” in the Lord’s Supper because of his modified understanding of sacraments. According to Zwingli, the sacraments serve as a public testimony of a previous grace. Therefore, the sacrament is “a sign of a sacred thing, i.e. of a grace that has been given.” For Zwingli, the idea that the sacraments carry any salvific efficacy in themselves is a return to Judaism’s ceremonial washings that lead to the purchase of salvation. What Zwingli could not accept was a “real presence” that claimed Christ was present in his physical body with no visible bodily boundaries. Had Zwingli’s modified doctrine of the “real presence” been an innovation, it would probably not have been so eagerly accepted by his parishioners. The symbolic view spread rapidly because Zwingli had given voice and legitimacy to an opinion that was already widespread. In Zurich, the mass was abolished in 1525. The Lord’s Supper was celebrated with a new liturgy that replaced the altar with a table and tablecloth. The striking feature of the Zwinglian observance of the sacrament was its simplicity. Because the bread and wine were not physically transformed into Christ’s body and blood, there was no need for spurious ceremonies and pompous rituals. The occasion was marked by simplicity and reverence, with an emphasis on its nature as a memorial. Zwingli’s denial of the “real presence” did not result in the neglecting of the sacrament that would characterize many of his followers in centuries to come. He saw seven virtues in the Lord’s Supper that proved its importance for the Christian life. Do read the articles linked above. While what he says on Lutheran doctrine is in accordance with what I know and believe, and what I know of how it was derived, and I am sort of assuming that as an Evangelical he knows a fair amount about Zwingli, I don’t know enough to comment intelligently about it. My original church had a fair amount of Reformed in it, but it was long ago, and I’ve long since come to believe in The Real Presence myself, actually before I became a Lutheran. It is just more consonant with the Lord’s words and the disciples’ reaction to them. Time for me to post something here, I reckon, and I think might do. The other day a document called “Correctio filialis de haeresibus propagatis“ (if your Latin is as bad as mine that translates as “A filial correction concerning the propagation of heresies”) was served on the Pope. What that document does is accuse him of teaching seven heresies. Not the kind of stuff that usually happens in the Catholic Church. In fact, the last time it happened was in 1333 to Pope John XXII. He later recanted his errors. I can’t really say that I see Francis doing that. I’m rather glad I’m not the recipient of that 25-page letter though. Lots of this has to do, I gather, with giving communion to the divorced and remarried, and beyond that I’m not prepared to go. We’ve discussed this at great length. Search for COMMUNION FOR THE REMARRIED in the search box above if you don’t already know what most of us think. It always leads to much heat and some hurt feelings, so let’s not overly rehash it still again. I tend to have sympathy with the conservative side of theological controversies, though not on this issue. The sacrament is given specifically to sinners for the forgiveness of their sins (Matthew 26:28), and is not to be reserved only for those in a state of moral perfection. But that is one of the “Lutheran” teachings that Pope Francis has approximated and which the signers consider heretical. But I still have sympathy for those who wrote and signed this letter. Conservative Catholics, almost by definition, revere and obey the papacy. To come to the conviction that the Pope is teaching heresy must be agonizing. 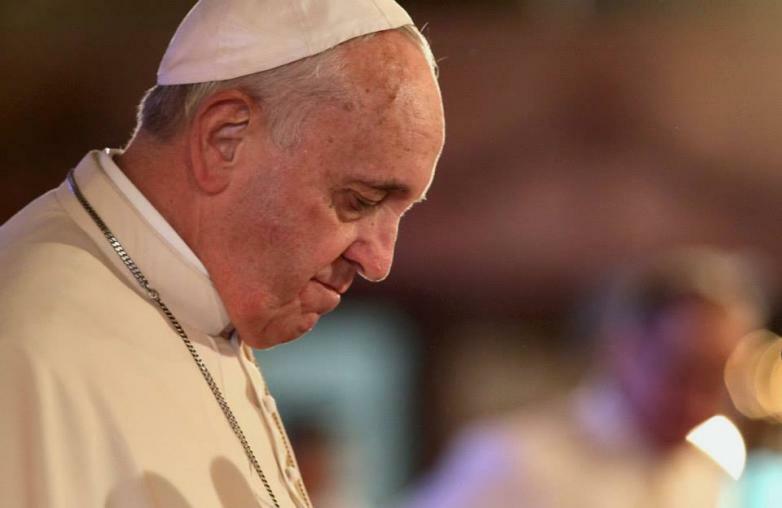 To believe that the Pope has violated the teachings of the Church Universal, that the papacy is not the protector of orthodoxy as has been assumed but a means of introducing innovative and problematic doctrines into the Church, can be a traumatic realization. And to take a stand on this conviction shows great integrity and courage. The signers may consider Luther to be a heretic. But at least they know now how he felt. Good thing it’s mostly bishops and academics signing this though. Henry VIII burned a few folks for that very thing, before he married one, of course. It was far from the longest marriage of his. Indeed it must be a horrendous nightmare for any churchman to come to that feeling about any of his bishops, but the Pope! I don’t envy them, but I too admire them greatly. It must take great courage to put your name on that document. They (whoever they may be) say that “May you live in interesting times” is a Chinese curse. I suspect we all understand why. It was well-known that Newman had lively doubts about the wisdom of pronouncing on Papal Infallibility, so there was some surprise when, in his response to Gladstone’s critique, he did just that. Newman’s defence of Infallibility deserves to be read in full, as it remains one of the best I know. That those who were making extreme claims for the dogma were as dissatisfied with it as those who disliked it; but as time has shown, Newman had it about right. Gladstone had claimed that since the Pope was infallible in matters concerning faith and morals, and since there was no area of life which did not involve at least one of these, he was, in practice, able to command the civic and public allegiance of his subjects: ‘therefore Catholics are moral and metal slaves, and every convert and member of the Pope’s Church places his loyalty and civic duty at the mercy of another.’[iv] Far from shying away from the duty of obedience to those set in ecclesiastical authority, Newman, in the best Protestant style, cited the relevant passage from St. Paul (Hebrews 13: 17) enjoining submission to those placed in positions of authority and challenged Gladstone directly: ‘Is there any liberalistic reading of this Scripture passage?’[v] Catholics held that the Pope was the successor of St. Peter; that being so the obedience paid to him was only that demanded by Holy Scripture itself – and Newman denied utterly that obedience to that authority amounted to ‘slavery’. He drew an analogy between divine and human law. The Law, he argued, was ‘supreme’ and those under it were bound to follow its direction, but no one would claim it ‘interferes either with our comfort or our conscience.’ Newman attempted to correct the English obsession with the power of the Pope. Catholic consciences, like those of any Christian, were regulated by an ancient system of moral theology deriving from sources common to all: the Ten Commandments; the Pauline injunctions of Faith, Hope and Charity; and the practices of fasting, sabbatarianism and tithing; the Pope had little, if anything, to do with these matters. The Pope’s jurisdiction lay in matters ecclesiastical, not in civil affairs; Gladstone’s evident confusion of the two was, Newman commented wryly, the origin of his alarm. Nor did Newman shy away from Gladstone’s attempt to link Infallibility and the Syllabus. He denied that any of the Pope’s words could be construed as releasing subjects from their allegiance to the State, or as condemning either freedom of the press or of conscience. Failing to anticipate where arguments for the latter would lead, Newman asserted that that no one would say that everything should be published, or that people had the right to unrestricted liberty; every State provided, in its laws, for limits to these things; it was the abuse of such liberty, not the liberties themselves, which the Pope condemned. It was the ‘liberty of self-will’ which was being anathematised, not liberty per se. The Syllabus was, Newman reminded Gladstone, a collection of propositions already condemned in the writings of previous Popes; it had been sent by Pius IX to his bishops, and could only be properly understood in that context; it contained no new matter by the Pope. None of this justified Gladstone’s equating the Syllabus with ex cathedra pronouncements of the Holy See: ‘Utterances which must be received as coming from an Infallible Voice, are not made every day, indeed they are very rare; and those which are by some persons affirmed or assumed to be such, do not always turn out what they are said to be.’ Patience was the ‘sine qua non’ when it came to the interpretation of documents emanating from Rome. It was quite untenable, in Newman’s view, to attribute Infallibility to the Syllabus; from this came all Gladstone’s errors. Newman’s words are as wise and relevant now as they were then, treading a line between the claims of the Ultramontanes and the liberals. Understood aright, Infallibility is the guard against Christ’s Church teaching error; no more, no less. On Tuesday I began what is going to turn into a series of posts about Catholicism and intellectual freedom. The locus classicus of this discussion for me is the debate between Gladstone and Newman caused by the former’s attack on what he called ‘Vaticanism’. For Gladstone, as for many Englishmen, Rome was the home of the a black legend of persecution and intellectual slavery. High Churchman though he was, Gladstone was never tempted to follow Newman or Manning across the Tiber; he was inoculated from their ‘Roman fever’ by his view of history. English history was the tale of moving from the darkness of feudal Catholicism to the light of Anglican constitutional government. He was no democrat, regarded it as a debased form of government where the mob might rule at the whim of a populist dictator. He was, he said, an ‘out and out inegalitarian’. If American democracy was at one end of the spectrum, the Vatican was at the other end. In his eyes what happened in Rome in 1871 was the revival of the old enemy of Papal absolutism. The dispute between Gladstone and Newman has to be seen against the background of the First Vatican Council (as it began to be called after its successor). The Vatican Decrees of 1871 were controversial before and after the Council. Many Catholics, Newman included, had considered it inopportune to make any declaration about Papal Infallibility. Newman had aroused some controversy at the time when the contents of what was meant to be a private letter to Bishop Ullathorne were leaked the press. ‘Why’, he asked, ‘should an aggressive and insolent faction be allowed to make the heart of the just sad, whom the Lord had not made sorrowful?’[i] Newman had not meant the letter for publication, but when it got into the press, he refused to retract his remarks, preferring instead to resort to his characteristic device of explaining with precision whom he had not meant by the offending comments. Many had supposed him to be referring to Manning and his Ultramontane colleagues; this Newman refused to confirm – or quite deny. By 1874 the controversy caused by the Decrees had quietened down, at least in the UK. But in November of that year Gladstone, who had lost power in the General Election six months earlier, published a pamphlet which poured petrol on the smouldering embers. Gladstone’s The Vatican Decrees in their bearing on Civil Allegiance: A Political Expostulation was a sizeable publication of seventy two pages. In it, he denounced ‘Vaticanism’ and all the works of Pius IX. In highly inflammatory language, he argued that henceforth no Roman Catholic could be considered a loyal subject of the Queen. The pamphlet was a best-seller, twenty five thousand copies were bought in the month after its publication in January 1874; by the end of the year 145,000 copies had been printed. Gladstone acknowledged that his language had been a little ‘rough’, but justified it by the seriousness of the matters under review, chief amongst which was ‘the question whether a handful of the clergy are or not engaged in an utterly hopeless and visionary attempt to Romanise the Church and people of England.’[ii] This, clearly, was aimed as much at the Tractarians in the Anglican Church as it was at Rome. He listed eighteen propositions from the Syllabus to prove his last point, denying that his words were aimed at ‘Roman Catholics generally’; his target was ‘the Papal Chair’ and ‘its advisers and abettors’. The only fault of individual Catholics lay in their submission to such a tyranny, which rejected ‘the old historic, scientific and moderate school’ of Catholics epitomised in the contents of Newman’s letter to Ullathorne. In citing Newman, Gladstone was trying to ‘strengthen and hearten’ the moderate Catholic party generally. [iv] His way of going about this was, to say the least, most unfortunate; nothing was less liable to achieve such an aim than quoting Newman’s letter. Gladstone’s pamphlet was welcomed by the Protestant world, not least by those Anglicans who had been pressing the Disraeli Government to pass legislation against Ritualism in the Church of England. Given the fact that Gladstone was himself a High Anglican, and that he had said little about Papal Infallibility at the time, despite the fact he had been Prime Minister then, the timing of his publication needs explaining before moving on to the question of why he mentioned Newman’s letter to Ullathorne. [i] C.S. Dessain and T. Gornall, The Letters and Diaries of John Henry Newman, volume XXV, (Oxford, 1975), pp. 18-20, letter to Ullathorne, 28 January 1870. [ii] W.E. Gladstone, The Vatican Decrees ion their bearing on Civil Allegiance: A Politicanal Exposulation (1874), pp. 4-5. [iii] Op. Cit. p. 6. [iv] Ramm, Gladstone, Granville Corr. volume II WEG to Granville, 7 December 1874, p. 461. The Catholic Magisterium is the power of the Catholic Church, as given it by the Son of God, Christ Jesus, to proclaim the truths of the Faith. The Magisterium exercises this teaching power in two different ways. This form of the teaching Magisterium is that which is used by popes to formally define articles of the faith infallibly. When the pope teaches this way, it is referred to as ex cathedra. This form of the teaching Magisterium is exercised by the Church in practices connected to faith and morals, in the common sense of the faithful, historical documents, unanimous consent of Church Fathers and theologians, when the faith is taught. Here Christ appoints Peter as the rock He will build His Church upon, promising that Satan’s power will not destroy it. Christ then gives Peter the keys to the kingdom of Heaven, a significant act showing Peter’s power of authority. Some will object and say that the original Greek of the Gospel lists Peter as Petros, meaning smaller rock; a stone, while the word for the rock Christ will build His church upon is petra, meaning large rock; a boulder. If Peter’s name meant “small rock”, then he could not be the foundation that Christ was speaking of. Instead, Christ must have been referring to Himself when speaking of the foundation of His Church. First, I am no Greek scholar myself, but have been told that in Koine Greek, the language of the New Testament, petra and petros are synonyms of each other. They simply translate as “rock”. The only form of Greek that they could not be used interchangeably is Attic Greek, as it is a form of Greek in which petros and petra have different meanings. Also, if Christ wished to express Peter’s inability to be His Church’s foundation, He could have referred to him as lithos, which means a small pebble in Greek. It was not as if Christ’s vocabulary was handicapped, or that He was trying to be deceptive or tricky. He said what He meant. In addition to the Greek of the Gospel, the meaning of Peter as the rock is bolstered in the language of Aramaic, the language Christ spoke. In Aramaic, the words for Peter and rock would be the same; kepha. Christ would have used kepha for both the words Peter and rock in the passage. This helps make clear the reality of what Christ was conferring on Peter; He was making him His Church’s foundation. The concept of the keys of the kingdom is interesting. In Scripture, keys were regarded as a symbol of the authority granted to a person. Christ giving the keys to Peter is not unlike an instance in the book of Isaiah. Isaiah gives His servant Eliacim the keys to the house of David, the kingdom of David that is, saying words similar to Christ’s. The power given both to Eliacim and Peter held great authority. Being given the keys to the kingdom, they both were able to make binding decisions no one could alter. Christ even tells Peter that the decisions he makes conducting His Church shall be ratified in Heaven. Can anyone top that? God ratifying your decisions? This was no small honor for Peter. It was a great responsibility. He was the rock on which Christ chose to build His Church. Here, Christ tells Peter of Satan’s desire to break up and destroy the Apostles, but Christ says He has prevented it through prayer. He then places Peter in charge of confirming, strengthening, the other Apostles. Peter is placed in charge of helping the other Apostles continue in the way of truth, and not allow them to be taken by the devil. This is one of several examples of the primacy and individual authority Peter possessed among the Apostles. Here, Christ places Peter in charge of His own flock, the Church. Peter is to be the head of Christ’s Church on earth, teaching Christ’s flock. Christ gives Peter His entire flock to take care of, making him a shepherd of His Church. Could the Scriptures be anymore plain as to reveal that Christ commissioned Peter to take charge of the Church after He ascended to Heaven? The early Christians are even plainer. Few, familiar with the wider Catholic blogosphere, can be unaware of the presence there of those who not only criticise the current Pope (a thing I may have done a time or two myself) , but who deny that he – and for that matter his immediate predecessors – is Pope at all. They cite various things in order to ‘prove’ their case, one being that they have all taken part in ecumenical gatherings which, they claim, no Catholic Pope would do; the question ‘according to whom?’ naturally arises. One theme of recent posts has been the place of Tradition within the Church. St Paul wrote about the traditions, oral and written which he had received and was passing on. These include the Scriptures themselves. Jesus wrote no book. He could have done so, and as Christians, we believe that Scripture is divinely inspired, but it needs interpreting, and that is why Jesus founded a Church with a teaching authority. The last Pope, Benedict XVI, was one of the most intelligent men ever to sit on the throne of St Peter, and he may well have been the best theologian ever to be Pope. But according to the wilder fringes of the Catholic blogosphere, we are asked to believe that this life-long, loyal and intelligent Catholic, knew so little about the history and theology of the Church in which he spent his entire adult life that he failed to spot what some new converts can see – that the Catholic Church has fallen away, and exists only in small pockets of the faithful, identifiable only to those who are ‘true’ Catholics. This is a Catholic (if it is Catholic at all) version of our friend Bosco with his talk about ‘the saved’ being able to identify those others who are ‘saved’. It is a version of what Protestants hold when they talk about the Church falling away in the time of Constantine; it is what non-Trinitarians say about the Trinity; it is what the Quartodecimans held about the decision to change the date at which the Passover started; it is what the Orthodox say about the filioque. The moment you decide that you know better than the teaching authority of the Church, then you must, perforce, fall back on one of two things: either your own unaided conscience; or the claim that your conscience is better informed by the Spirit than the Church founded by Christ. There is a third option – to insist that a particular point in time was the golden age, and that whatever it was the Church taught then it must profess in that form for ever. This was the claim of those who opposed Nicaea; it was the claim of those who opposed the teaching of the “Theotokos” and it was the claim of those who opposed Chalcedon. What does “People of God” mean? First of all it means that God does not belong in a special way to any one people; for it is He who calls us, convokes us, invites us to be part of his people, and this invitation is addressed to all, without distinction, for the mercy of God “desires all men to be saved” (1 Tim 2:4). Jesus does not tell the Apostles or us to form an exclusive group, a group of the elite. Jesus says: go out and make disciples of all people (cf. Mt 28:19). St Paul says that in the People of God, in the Church, “there is neither Jew nor Greek… for you are all one in Christ Jesus” (Gal 3:28). I would also like to say to anyone who feels far away from God and the Church, to anyone who is timid or indifferent, to those who think they can no longer change: the Lord calls you too to become part in his people and he does this with great respect and love! He invites us to be part of this people, the People of God! Now, whilst, as with any Pope, this one is subject to criticism, here he enunciates something which a Church facing a secularised and/or hostile world, would do well to remember. That some orthodox Catholics might remind this Pope that what he said applies to them, despite some of his recent language, would be a better response to his scolding than claiming he is not the Pope. 2. Since, however, it would be very tedious, in such a volume as this, to reckon up the successions of all the Churches, we do put to confusion all those who, in whatever manner, whether by an evil self-pleasing, by vainglory, or by blindness and perverse opinion, assemble in unauthorized meetings; [we do this, I say,] by indicating that tradition derived from the apostles, of the very great, the very ancient, and universally known Church founded and organized at Rome by the two most glorious apostles, Peter and Paul; as also [by pointing out] the faith preached to men, which comes down to our time by means of the successions of the bishops. For it is a matter of necessity that every Church should agree with this Church, on account of its pre-eminent authority, [The Latin text of this difficult but important clause is, “Ad hanc enim ecclesiam propter potiorem principalitatem necesse est omnem convenire ecclesiam.”]. 1. After all these [writings of] the prophets and the evangelical and apostolic scriptures which we discussed above, on which the catholic church is founded by the grace of God, we also have thought necessary to say what, although the universal catholic church diffused throughout the world is the single bride of Christ, however the holy Roman church is given first place by the rest of the churches without [the need for] a synodical decision, but from the voice of the Lord our saviour in the gospel obtained primacy: ‘You are Peter,’ he said, ‘and upon this rock I shall build my church and the gates of hell shall not prevail against it; and to you I give the keys of the kingdom of heaven, and whatever you shall bind upon Earth shall be bound also in heaven and whatever you release upon Earth shall also be released in heaven’. 2. In addition there is also the presence of the blessed apostle Paul, ‘the chosen vessel’, who not in opposition, as the heresies jabber, but on the same date and the same day was crowned in glorious death with Peter in the city of Rome suffering under Nero Caesar; and equally they made the above-mentioned holy Roman church special in Christ the Lord and gave preference in their presence and veneration-worthy triumph before all other cities in the whole world. 3. Therefore first is the seat at the Roman church of the apostle Peter ‘having no spot or wrinkle or any other [defect]’. I think it is my duty to consult the chair of Peter, and to turn to a church whose faith has been praised by Paul. I appeal for spiritual food to the church whence I have received the garb of Christ … Away with all that is overweening; let the state of Roman majesty withdraw. My words are spoken to the successor of the fisherman, to the disciple of the cross. As I follow no leader save Christ, so I communicate with none but your blessedness, that is with the chair of Peter. For this, I know, is the rock on which the church is built! The notion that the claims of the Papacy are anything new, or anything to do with some supposed ‘Roman State Run religion’ (@Bosco) is easily disproved by a reading of the Church Fathers. That is not to say that the office has not developed, as, indeed, our understanding of it has done, but it is to say that it has been a part of Christian history from the point at which there is any such thing. An examination of the name lists in the NT will reveal that Peter is most often at the head of them; another sign that he was considered the leader. But we should take care here; leader does not mean supreme autocrat. Language which sees him as the ‘prince’ of the Apostles can seriously mislead. We see from Acts that St James presided over the Council of Jerusalem, and we can see from Paul that whilst Peter was ‘one of the pillars’ he was not the sole one. The other Apostles had also been given the power to bind and loose, and whilst it seems that Peter’s pre-eminence was acknowledged, it would be a mistake to see him as in any sense of the word ‘a prince’. Was Peter ever in Rome? Well, the tradition is that he was crucified there in Nero’s time, and it would have been difficult for that to have happened had he not set foot in the place. Let us turn to see what the Fathers say. I will add here that I am no fan of florilegia which simply cherry-pick quotations, and I shall, even at the risk of a couple of more posts, try not to do that. Tertullian (150-220), writing in his Prescription Against Heretics: “Was anything withheld from the knowledge of Peter, who is called ‘the rock on which the church should be built’ … ?” Tertullian wrote the Prescription c. A.D. 199, during the orthodox period of his life. Here, he equates the “rock” in question to the Apostle Peter. Like other Fathers he believes in Apostolic succession and in the authority of Rome. But one might easily say that what concerns Tertullian is the preservation of the truth of the gospel, not the establishment of a permanent Roman see with all the authority of an apostolic office. For example, according to Tertullian, Peter ordained Clement to succeed him as bishop of Rome and the teachings of Clement may be trusted because he received his teaching from the Apostle Peter himself. But does that mean that Clement inherited Peter’s apostolic office, or his position as “rock”? If it doesn’t, then it is hard to see why Tertullian attaches such importance to Clement receiving his teaching from Peter; if he did not succeed Peter, why bother to mention it? ‘But,’ you say ‘the Church has the power of forgiving sins.’ This I acknowledge and adjure more (than you; I) who have the Paraclete Himself in the persons of the new prophets… . I now inquire into your opinion, (to see) from what source you usurp this right to ‘the Church.’ If, because the Lord has said to Peter, ‘Upon this rock will I build My Church,’ ‘to thee have I given the keys of the heavenly kingdom;’ or, ‘Whatsoever thou shall have bound or loosed in earth, shall be bound or loosed in the heavens,’ you therefore presume that the power of binding and loosing has derived to you, that is, to every Church akin to Peter, what sort of man are you, subverting and wholly changing the manifest intention of the Lord, conferring (as that intention did) this (gift) personally upon Peter? ‘On thee,’ He says, ‘will I build My Church; ‘and I will give to thee the keys,’ not to the Church; and, ‘Whatsoever thou shall have loosed or bound,’ not what they shall have loosed or bound. For so withal the result teaches. In (Peter) himself the Church was reared; that is, through (Peter) himself; (Peter) himself essayed the key… . For in accordance with the person of Peter, it is to spiritual men that this power will certainly appertain, either to an apostle or else to a prophet… . and thus from that time forward, every number (of persons) who may have combined together into this faith is accounted ‘a Church’ from the Author and Consecrator (of the Church). And accordingly ‘the Church,’ it is true, will forgive sins: but (it will be) the Church of the Spirit, by means of a spiritual man; not the Church which consists of a number of bishops. So, we see that when he was orthodox, Tertullian supported the claims of the Pope; when he was not, he quibbled. It was an early example of a pattern with a long history. But it ought to put an end to the idea that the Petrine claims in any way arose with Leo the Great. The claims of the Church with regard to the office of the Pope go back to the very words of Jesus Christ himself. In Matthew 16:13–20 we read the famous confession of faith by Peter at Caesarea Philippi. In response to his statement affirming him as the “Son of the Living God,” Jesus tells Peter: “I tell you, you are Peter [Greek: petros] and on this rock [Greek: petra]. I will build my church …” Here we see Jesus change the name of Simon to ‘Rock’, before saying that He would build his Church on that Rock. There is a perfectly natural explanation for the πέτρος (petros) / πέτρα (petra) construction: πέτρα (petra) is a feminine word. Jesus could hardly have used a feminine noun as the name of Simon Peter—“You are Petrina”? So, grammatically, we have a problem. On the one hand, one cannot use πέτρος (petros) to describe a suitable foundation for a building project—for that, again as Matthew 7:24 indicates, one must speak of πέτρα (petra). Yet, on the other hand, Jesus can hardly name Peter, πέτρα (petra)—because the word is feminine! Jesus can’t give Peter a feminine name! In fact, if Jesus wanted to apply the terminology of the πέτρα (petra), i.e., that which the Church is built upon, to Peter, we would expect to find very kind of shift in language we have in Matthew 16:18. The reason for the different Greek form is simply that Peter, as a man, needs a masculine name, and so the form Petros has been coined. But the flow of the sentence makes it clear that the wordplay is intended to identify Peter as the rock. It is hard to see how any plain reading of the text can make Jesus the object of the sentence. If there was no connection to Peter then precisely what point was being made by Our Lord when He changed Simon’s name? Jesus could have used the Greek word ‘lithos’ if he had wanted to make it clear there was no connection. Nor will it do, as the piece I cited above, does to reject the argument that the Aramaic, Kefas/Caphas definitely refers to Peter. Throughtout the NT the form Kephas is mentioned, so it is clear that there is a significance in the name change. (John 1:42; 1 Cor 1:12; 3:22; 9:5; 15:5; Gal 1:18; 2:9, 11, 14). Simon’s name was changed to rock for a reason. If Protestantism requires one plays games with words to deny that, then its house is not built on rock. The deliberate use of the “pevtra-Pevtro” pun in 16:18, the only verse in the entire NT that contains both words, seems to indicate the Jesus specifically singled out the apostle Simon Peter as the “rock” in question. Peter is not given this position because he is inherently worthy; instead, he receives this title because he confessed his faith in the Messiah. But, even if you grant this argument (and you may not) is that the same as saying that the Roman claims are correct? To show that a number of things would need to be shown: that what Christ conferred on Peter was something that could be passed on only to the Bishop of Rome; and that the powers were as Rome has claimed. It is to those topics we must turn.